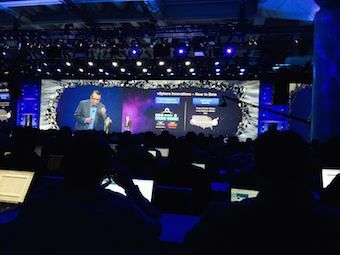 The main keynote topic for today at VMworld was how to address the coming cloud tsunami. Pat citing his own researchers believes that 50% of all workloads (OS instances) will be running in public and private cloud by 2021 and by 2030, 50% of all workloads will be running in the Public Cloud alone. So today VMware announced two new offerings: VMware Cloud Foundation and VMware Cross-Cloud Services. Cloud Foundation appears to be a bundling of VMware’s SDDC, NSX®, Virtual SAN™ (VSAN) and vSphere® solutions, into a single, integrated stack/package that can be sold and licensed together. No pricing was provided at the show but essentially VMware want’s to allow customers a simple way to deploy a VMware private cloud. VMware states that Cloud Foundation offers customers up to 6-8X faster cloud deployment at a TCO savings of >40%. VMware also announced a joint partnership with IBM to sell Cloud Foundation services residing on the IBM Cloud to their customer base. This broaden’s the availability of VMware cloud service offerings beyond vCloud and on premises Cloud Foundation environments. Everyone wants to minimize cloud vendor lockin but that’s not possible today except in a few special cases (NetApp Private Storage and similar capabilities from other vendors, cloud storage gateway services, cloud archive services, etc.). VMware Cross-Cloud Services is the next step down this path, attempting to provide easier workload/data migration, consolidated cost and workload management and security deployment across the public and private cloud boundaries. Cross-Cloud Services was in tech preview at the show but it’s intended to make use of standard public cloud defined APIs to provide specialized targeted services to allow better cross-cloud migration and management. The tech preview showed VMware Cross-Cloud Services deploying an NSX gateway in AWS which allowed NSX to control public cloud IP addresses and then once that was done, one could apply security templates to deploy network encryption between apps and its services. VMware used a sniffer to show the before plain text traffic and the after with encrypted traffic, all done in a matter of minutes. 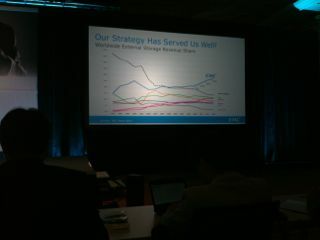 They also showed cost trending information for workloads running across the private and public cloud. 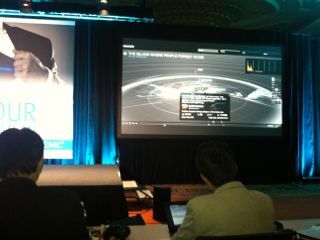 Next they showed a demo (movie) of VMware migrating/cloning a simple app to other public and private cloud environments. They had a public cloud Unicycle IOT app running in Ireland/AWS (I think) with a three tier (web, app, database) app structure/instances and then migrated/cloned that single site 3-tier app to be deployed across multiple cloud (web and app tiers) sites with a single database instance running in a private cloud. I started thinking this is getting us down the path towards cloud virtualization but in the end, it’s much more targeted services, which run in instances/gateways in the public and private cloud to do very specific migration or management activities. Nonetheless a great first step towards more flexible cross-cloud deployment and management. VMworld Day 2 looks to be more on current products and enhancements, stay tuned. Sometimes, long after I listen to a vendor’s discussion, I come away wondering why they do what they do. Oftentimes, it passes but after a recent session with Pure Storage at SFD10, it lingered. In the last week or so, executives at Hitachi mentioned that they plan to reduce hardware R&D activities for their high end storage. There was much confusion what it all meant but from what I hear, they are ahead now, and maybe it makes more sense to do less hardware and more software for their next generation high end storage. We have talked about hardware vs. software innovation a lot (see recent post: TPU and hardware vs. software innovation [round 3]). At TechFieldDay 10 (TFD10), in Austin this past week we had a presentation from Platform9‘s Shirish Raghuram Co-founder and CEO and Bich Le, Co-founder and Chief Architect. Both Shirish and Bich seemed to have come from having worked a long time at VMware and prior to that, other tech giants. Platform9 provides a user friendly approach to running OpenStack in your data center. Their solution is a SaaS based, management portal or control plane for running compute, storage and networking infrastructure under OpenStack, the open source cloud software. If you have a current, running VMware vSphere environment, you can onboard or import portions of or all of your VMs, datastores, NSX nodes, and the rest of the vSphere cluster and have them all come up as OpenStack core compute instances, Cinder storage volumes, and use NSX as a replacement for Neutron networking nodes. In this case, once your vSphere environment is imported, users can fire up more compute instances, terminate ones they have, allocate more Cinder volumes, etc. all from an AWS-like management portal. 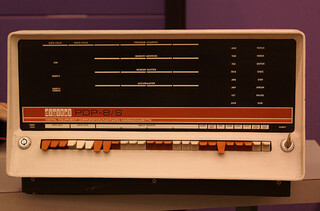 It’s as close to an AWS console as I have seen. Platform9 also works for KVM environments, that is you can import currently running KVM environments into OpenStack and run them from their portal. Historically, the problem with OpenStack was its user interface. Platform9 solves this problem and makes it easy to import, use, and deploy VMware and KVM environments into an OpenStack framework. Once there, users and administrators have the same level of control that AWS and Microsoft Azure users have, i.e., fire up compute instances, allocate storage volumes and attach the two together, terminate the compute activities, detach the volumes and repeat, all in your very own private cloud. If you don’t have a current KVM or VMware environment, Platform9 will deploy a KVM virtualization environment on bare metal servers and storage and use that for your OpenStack cloud. Security comes from tenant attributes, certain tenants have access and control over certain compute/storage/networking instances. Customers can also use Platform9 as a replacement for vCenter, and once deployed under OpenStack, tenants/users have control over their segments of the private cloud deployment. It handles multiple vSphere & KVM clusters as well and can also handle mixed virtualization environments within the same OpenStack cloud. The only things I found missing from the Platform9 solution was Swift Object storage support and support for Hyper-V environments. The Platform9 team mentioned that multi-region support was scheduled to come out this week, so then your users could fire up compute and storage instances across your world wide data centers, all from a single Platform9 management portal. Pricing for the Platform9 service is on a socket basis, with volume pricing available for larger organizations. If you are interested in a private cloud and are considering OpenStack in order to avoid vendor lock-in, I would find it hard not to give Platform9 a try. Why would VMware with years of ESX development behind them want to develop a whole new virtualization system for Docker and other container frameworks. Especially since they already have a compatible Docker support in their current product line. The main reason I can think of is that a 64 node cluster may be limiting to some container services and the likelihood of VMware ESX/vSphere to supporting 1000s of nodes in a single cluster seems pretty unlikely. 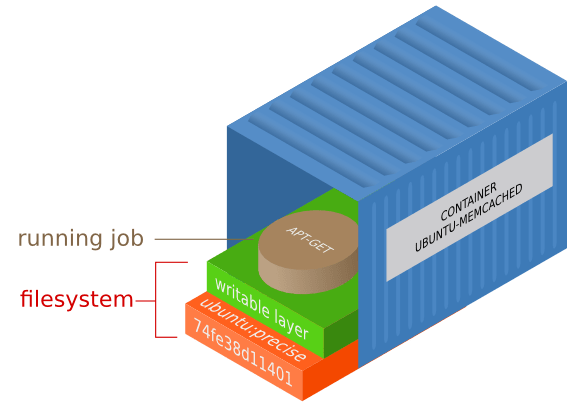 So given that more and more cloud services are being deployed across 1000s of nodes using container frameworks, VMware had to do something or say goodbye to a potentially lucrative use case for virtualization. Yes over time VMware may indeed extend vSphere clusters to 128 or even 256 nodes but by then the world will have moved beyond VMware services for these services and where will VMware be then – left behind. With the new Photon system VMware has an answer to anyone that needs 1000 to 10,000 server cluster environments. Now these customers can easily deploy their services on a VMware Photon Platform which is was developed off of ESX but doesn’t have any cluster limitations of ESX. Thus, the need for Photon was now. Customers can easily deploy container frameworks that span 1000s of nodes. Of course it won’t be as easy to manage as a 64 node vSphere cluster but it will be easy automated and easier to deploy and easier to scale when necessary, especially beyond 64 nodes. The claim is that the new Photon will be able to support multiple container frameworks without modification. So what’s stopping you from taking on the Amazons, Googles, and Apples of the worlds data centers? Maybe storage, but then there’s ScaleIO, and the other software defined storage solutions that are there to support local DAS clusters spanning almost incredible sizes of clusters. Maybe networking, I am not sure just where NSX is in the scheme of things but maybe it’s capable of handling 1000s of nodes and maybe not but networking could be a clear limitation to what how many nodes can be deployed in this sort of environment. 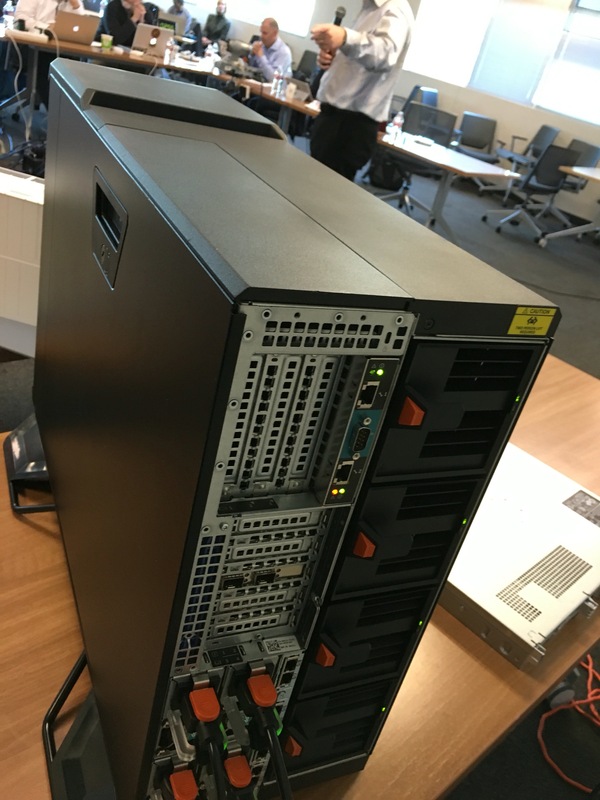 Where does this leave vSphere? Probably continuation of the current trajectory, making easier and more efficient to run VMware clusters and over time extending any current limitations. So for the moment two development streams based off of ESX and each being enhanced for it’s own market. How much of ESX survived is an open question but it’s likely that Photon will never see the VMware familiar services and operations that is readily available to vSphere clusters. Here’s my thoughts on SNWUSA which occurred this past week in the Long Beach Convention Center. First, it was a great location. I saw a number of users I haven’t seen at SNWUSA ever before, some of which I have known for years from other (non-storage) venues. Second, the exhibit hall was scantly populated. There were no major storage vendors at the show at all. Gold sponsors included NEC, Riverbed, & Sepaton, representing the largest exhibiters presenn. Making up the next (Contributing) tier were Western Digital, Toshiba, Active Archive Alliance, and LTO consortium with a smattering of smaller companies. Finally, there were another 12 vendors with kiosks around the floor, with the largest there being Veeam Software. I suspect VMWorld Europe happening the same time in Barcelona might have had something to do with the sparse exhibit floor but the trend has been present for the past few shows. Coho Data who came out of stealth with a scale out, RAIN (Redundant array of independent nodes) based storage cluster, with distributed, mirrored customer data across nodes and software defined networking. They currently support NFS for VMware with a management UI reminiscent of IOS 7 sans touch support. The product comes as a series of nodes with SSDs, disk storage and SDN. The SDN allows Coho Data to relocate front-end (client) connections to where the customer data lies. The distributed, mirrored backend storage provides redundancy in the case of a node/disk failure, at which time the system understands what data is now at risk and rebuilds the now-mirorless data onto other nodes. It reminds me a lot of Bycast/Archivas like architectures, with SDN and NFS support. I suppose the reason they are supporting VMware VMDKs is that the files are fairly large and thus easier to supply. Cloud Physics was not exhibiting but they sponsored a break. As such, they were there talking with analysts and the press about their product. Their product installs as a VMware VM service and propagates VMware management agents to ESX servers which then pipe information back to their app about how your VMware environment is running, how VMs are performing, how your network and storage are performing for the VMs running, etc. This data is then sent to the cloud, where it’s anonymized. In the cloud, customers can use apps (called Cards) to analyze this data in the cloud, which can help them understand problem areas, predict what configuration changes can do for them, show them how VMs are performing, etc. It essentially is logging all this information to the cloud and providing ways to analyze the data to optimize your VMware environment. Coming in just behind these two was Jeda Networks with their Software Defined Storage Network (SDSN). They use commodity (OpenFlow compatible) 10GbE switches to support a software FCoE storage SAN. Jeda Networks say that over the past two years, most 10GbE switch hardware have started to support DCB in hardware and with that in place, plus OpenFlow compatibility, they can provide a SDSN on top of them just by emulating a control layer for FCoE switches. Of course one would still need FCoE storage and CNAs but with that in place one could use much cheaper switches to support FCoE. Enterprise level where you get all the above plus all the Card Apps presently available for $150/ESX server/Month. Jeda networks and Coho Data are still developing their pricing and had none they were willing to disclose. One of the CloudPhysics Card apps could predict how certain VMs would benefit from host based (PCIe or SSD) IO caching. They had a chart which showed working set inflection points for (I think) one VM running an OLTP application. I have asked for this chart to discuss further in a future post. But although CloudPhysics has the data to produce such a chart, the application shows three potential break points where say adding 500MB, 2000MB or 10000MB of SSD cache can speed up application performance by 10%, 30% or 50% (numbers here made up for example purposes and not off the chart they showed me). A few other companies made announcements at the show. For example, Sepaton announced their new VirtuoSO, scale out hybrid reduplication appliance. That’s about it. I would have to say that SNW needs to rethink their business model, frequency of stows or what they are trying to do at their conferences. However, on the plust side, most of the users I talked with came away with a lot of information and thought the show was worthwhile and I came away with a few surprises. I was at a conference a month or so ago and one speaker mentioned that the number of x86 servers being sold has peaked and is dropping. I can imagine a number of reasons for this and the main one being server virtualization. But this speaker had a different view and it seemed to be the cloud. He said that three companies were purchasing over 1/2 the x86 servers these days. I feel that there should be at least four Google, Facebook, Amazon & Microsoft and maybe five, if you add in Apple. Something has happened over the past year or so. Enterprise IT has continued along its merry way but the adoption of cloud services is starting to take off. I have seen this before, with mainframes, then mini-computers, and now client-server. Minicomputers came out and were so easy to use and develop/deploy applications on, that people stopped creating new apps on the mainframe. Mainframes never died out, and probably have never really stopped shipping increasing MIPS every year. But the share of WW MIP installations for mainframes has been shrinking for decades and have never got going again. Ultimately, the proprietary minicomputer was just a passing fad and only lasted about 25 years or so. It was wounded by the PC, and then killed off by proprietary Unix workstations. Then it happened again, the new upstart this time was Windows Server and Linux. Once again it was just easier to build apps on these new and cheaper servers, than any of the older Unix servers. Of course there’s still plenty of business in proprietary Unix servers, but again I would venture to say that their share of WW installed MIPS has been shrinking for a long time. Nowadays, the cloud is mortally wounding the server market. Server virtualization is helping a lot but it’s also enabling the cloud to eliminate many physical server sales. This is because new applications, new IT environments are being ported/moved/deployed onto the cloud. In this new, cloud world, customers need less servers, less networking and less enterprise class storage. Yes not every application is suitable to cloud deployment but that’s why there’s still mainframes, still Unix servers, and a continuing need for standalone, physical or virtual x86 servers in the enterprise. But their share of MIPs will start shrinking soon if it hasn’t already. Ok, so enterprise data center share of MIPs will start shrinking vis a vis cloud data centers. But what happens to networking and storage. My view is that networking becomes software defined and there’s a component of that which operates on special purpose hardware. This will increase in shipments but the more complex, enterprise class networking equipment will flatline and never see any more substantial growth. And up until yesterday I felt much the same about enterprise class storage. Software defined storage in my future, DAS and SSDs for the capacity and the smarts exist in software if at all. Today, most of the cloud and many service providers have been moving off enterprise class storage and onto DAS. But yesterday I heard about NetApp private storage for the cloud. This is a configuration of NetApp storage installed in a CoLo facility with a “direct connection” to Amazon compute cloud. In this way, enterprise customers can maintain data stewardship/ownership/governance over their data while at the same time deploying applications onto AWS compute cloud. This seems to be one of the sticking points to enterprise customers adopting the cloud. By having (data) storage owned lock/stock&barrel by the enterprise it seems much easier and less risky to deploy new and old applications to the cloud. Whether this pans out and can provide enough value to cover the added expense of the enterprise class storage, only the market can decide. But this is the first time I can remember, where any vendor has articulated a role for enterprise class storage in the cloud. Let’s hope it works. 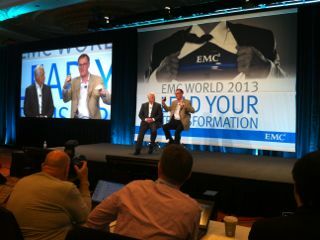 The first session of the day was with Joe Tucci EMC Chairman and CEO. He talked about the trends transforming IT today. These include Mobile, Cloud, Big Data and Social Networking. He then discussed IDC’s 1st, 2nd and 3rd computing platform framework where the first was mainframe, the second was client-server and the third is mobile. Each of these platforms had winers and losers. EMC wants definitely to be one of the winners in the coming age of mobile and they are charting multiple paths to get there. Mainly they will use Pivotal, VMware, RSA and their software defined storage (SDS) product to go after the 3rd platform applications. Pivotal becomes the main enabler to help companies gain value out of the mobile-social networking-cloud computing data deluge. SDS helps provide the different pathways for companies to access all that data. VMware provides the software defined data center (SDDC) where SDS, server virtualization and software defined networking (SDN) live, breathe and interoperate to provide services to applications running in the data center. Joe started talking about the federation of EMC companies. These include EMC, VMware, RSA and now Pivotal. He sees these four brands as almost standalone entities whose identities will remain distinct and seperate for a long time to come. Joe mentioned the internet of things or the sensor cloud as opening up new opportunities for data gathering and analysis that dwarfs what’s coming from mobile today. He quoted IDC estimates that says by 2020 there will be 200B devices connected to the internet, today there’s just 2 to 3B devices connected. 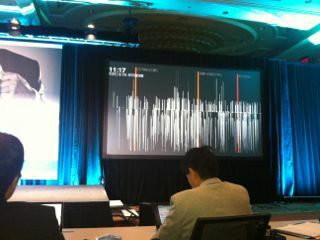 Paul Maritz, Pivotal CEO got up and took us through the Pivotal story. Essentially they have three components a data fabric, an application development fabric and a cloud fabric. He believes the mobile and internet of things will open up new opportunities for organizations to gain value from their data wherever it may lie, that goes well beyond what’s available today. These activities center around consumer grade technologies which 1) store and reason over very large amounts of data; 2) use rapid application development; and 3) operate at scale in an entirely automated fashion. He mentioned that humans are a serious risk to continuous availability. Automation is the answer to the human problem for the “always on”, consumer grade technologies needed in the future. 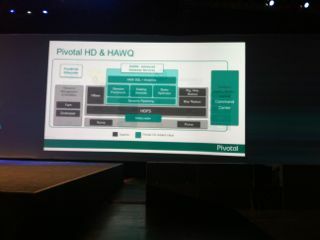 Parts of Pivotal come from VMware, Greenplum and EMC with some available today in specific components. However by YE they will come out with Pivotal One which will be the first framework with data, app development and cloud fabrics coupled together. Paul called Pivotal Labs as the special forces of his service organization helping leading tech companies pull together the awesome apps needed for the technology of tomorrow, consisting of Extreme programming, Agile development and very technically astute individuals. Also, CETAS was mentioned as an analytics-as-a-service group providing such analytics capabilities to gaming companies doing log analysis but believes there’s a much broader market coming. Paul also showed some impressive numbers on their new Pivotal HD/HAWQ offering which showed it handled many more queries than Hive and Cloudera/Impala. In essence, parts of Pivotal are available today but later this year the whole cloud-app dev-big data framework will be released for the first time. Next up was a media-analyst event where David Goulden, EMC President and COO gave a talk on where EMC has come from and where they are headed from a business perspective. Then he and Joe did a Q&A with the combined media and analyst community. The questions were mostly on the financial aspects of the company rather than their technology, but there will be a more focused Q&A session tomorrow with the analyst community. Joe was asked about Vblock status. He said last quarter they announced it had reached a $1B revenue run rate which he said was the fastest in the industry. Joe mentioned EMC is all about choice, such as Vblock different product offerings, VSpex product offerings and now with ViPR providing more choice in storage. Sometime today Joe had mentioned that they don’t really do custom hardware anymore. He said of the 13,000 engineers they currently have ~500 are hardware engineers. He also mentioned that they have only one internally designed ASIC in current shipping product. Then Paul got up and did a Q&A on Pivotal. He believes there’s definitely an opportunity in providing services surrounding big data and specifically mentioned CETAS as offering analytics-as-a-service as well as Pivotal Labs professional services organization. Paul hopes that Pivotal will be $1B revenue company in 5yrs. They already have $300M so it’s well on its way to get there. Next, there was a very interesting media and analyst session that was visually stimulating from Jer Thorp, co-founder of The Office for Creative Research. And about the best way to describe him is he is a data visualization scientist. He took some NASA Kepler research paper with very dry data and brought it to life. Also he did a number of analyzes of public Twitter data and showed twitter user travel patterns, twitter good morning analysis, twitter NYT article Retweetings, etc. He also showed a video depicting people on airplanes around the world. He said it is a little known fact but over a million people are in the air at any given moment of the day. Jer talked about the need for data ethics and an informed data ownership discussion with people about the breadcrumbs they leave around in the mobile connected world of today. If you get a chance, you should definitely watch his session. Next Juergen Urbanski, CTO T-Systems got up and talked about the importance of Hadoop to what they are trying to do. He mentioned that in 5 years, 80% of all new data will land on Hadoop first. 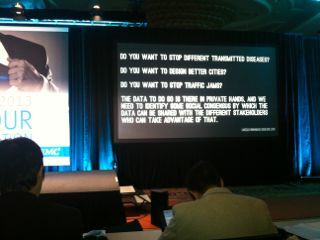 He showed how Hadoop is entirely different than what went before and will take T-Systems in vastly new directions. Next up at EMCworld main hall was Pat Gelsinger, VMware CEO’s keynote on VMware. The story was all about Software Defined Data Center (SDDC) and the components needed to make this happen. He said data was the fourth factor of production behind land, capital and labor. Pat said that networking was becoming a barrier to the realization of SDDC and that they had been working on it for some time prior to the Nicera acquisition. But now they are hard at work merging the organic VMware development with Nicera to create VMware NSX a new software defined networking layer that will be deployed as part of the SDDC. Pat also talked a little bit about how ViPR and other software defined storage solutions will provide the ease of use they are looking for to be able to deploy VMs in seconds. Pat demo-ed a solution specifically designed for Hadoop clusters and was able to configure a hadoop cluster with about 4 clicks and have it start deploying. It was going to take 4-6 minutes to get it fully provisioned so they had a couple of clusters already configured and they ran a pseudo Hadoop benchmark on it using visual recognition and showed how Vcenter could be used to monitor the cluster in real time operations. Pat mentioned that there are over 500,000 physical servers running Hadoop. Needless to say VMware sees this as a prime opportunity for new and enhanced server virtualization capabilities. That’s about it for the major keynotes and media sessions from today. Tomorrow looks to be another fun day.